Welcome to the Bob's Discount Furniture complaints department brought to you by HissingKitty. Experienced poor customer service? We make it easy to file a formal complaint against Bob's Discount Furniture online. Simply use our free form and your feedback will be instantly forwarded for review. Need to contact the Bob's Discount Furniture corporate office? We have the mailing address, phone number, and email address listed below. First delivery from Bob’s Discount furniture 1/30/18: Large couch, console, and love seat. We were told this console could be placed anywhere – between the two large couch seats, or the two love seat pieces. Once in my home, the delivery guys seemed confused about how I wanted it set up; then I realized why. The console is NOT mobile – it is permanently attached to the loveseat. Because it didn’t look as I wanted it to, I spoke to the salesman (Steve Briskin sp?) later and he confirmed his error. They did offer to take the furniture back. In addition to not being what I wanted, the delivery men ripped the end off of one of the power recliner wires, so that would have needed replaced as well. When I got a call back from the manager, Norm, a little while later, he offered $200 off if I chose something else in the store. I wasn’t sure, but I wanted new furniture, so I looked at a sectional and decided to get it, though the material wasn’t exactly what I wanted, I thought I might like it ok. Delivery was set for a week later. The men were taking the previously ordered couch/love seat and bringing in the new stuff. 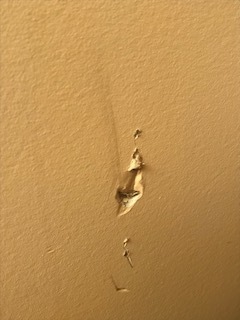 While disassembling the old furniture, the men gouged three places in my wall (pic attached). And the new furniture, there was no wedge with it! I called the sales guy again, he says ‘there is no wedge in the furniture set you ordered’. Um, I took a picture of it, thank goodness!! So, I sent the picture, and what do you know, he calls to say he neglected to order the wedge with the rest of the furniture. Same sales guy as last time (he says I must think he is an idiot – I am mum). Being it was another $400 for the wedge, I wanted to just forget the whole thing, but I ordered it and set up yet another delivery date to get the wedge. At least they didn’t charge delivery on all these mishaps. Unfortunately, I’ve started reading reviews on Bob’s throughout all this aggravation and also seeing constant complaints about the Goof Proof coverage, which I also purchased. I’m thinking, just 24 hours later, maybe I can just return the whole set and be done with Bob’s…. but no. After a long conversation with customer service, they would not budge on doing a return. Supposedly there is to be some type of “compensation” for all our troubles, but they can’t tell us what exactly that will amount to – not until everything (wedge included) had been delivered, which it now has, as of this morning. I’m sure I’ll have to keep badgering them for follow-up. I also want to just “return” the goof proof coverage, but I’m sure I’ll get nowhere on that. The best I can do now is to try to spread the word. You might get lucky with these people, but it’s like Russian roulette, so tread carefully. And now, I have seen a sectional I really, really like at Lazor Furniture in Latrobe, PA. It is a family owned business, extremely nice people run it. They have no delivery fee; the gentleman running the place, Conrad Lazor, told us that we were free to get furniture protection but he wasn’t pushing it; didn’t think we’d really need it. I had looked there while looking at other places, including Bob’s. Not sure why I didn’t just run with it. Now I’m stuck. Have feedback for Bob's Discount Furniture?